6 liokaisers in 1 auction WTF??? Discussion in 'Transformers On Ebay' started by wheeljaxx, Mar 25, 2008. Heh..."This is an amazing auction!" I am sure that the heads and guns are repro / customs. The seller's name is awesome, and he was not kidding about his auction being amazing. The real problem is going to start if the winner wants to track down those breastplates or authentic weapons. Yikes. yeah, I mean half of the coolness of these guys was the breast partners. they're not worth anything to me without them. lol, this seller, i sent him an ebay message before. as MG has been championing, these were chinese issues (NOT KO!!!!) that came out in the 90s, a little later than the japanese release. he's sold at least 4 MIB liokaisers and other old Transformers like nighbeat and road caesar. This seller has been selling Liokaiser's MISB, MIB, loose complete whatever for years. I think I got my MIB Road Caesar from him. I might bid on this. Yah those are definitely the Chinese issues. The Killbison in the Chinese set is browner/darker than the Japanese set, which has a more vibrant gold. This guy has been selling liokaisers like crazy every few months he will popup and sell a handfull he has been doing this for a good two years now. If I win this auction, I might split it with you guys. This is the loose one I got two days ago (forgot to picture the breastforce partners; only missing Jargua's partner - otherwise 100% complete). The combiner head on this Liokaiser is authentic and so are the weapons. I would rate the item as C8. This seller seems to have 'stumbled' upon a warehouse of opened & unopened transformers that were produced by takara in China in the early nineties. I bought a MISB Nightbeat from him and the item was in fanatastic shape. He's been selling Liokaisers for a while now and I have a feeling his supply is drying thin. I have the distinct feeling the six in his auction are his last ones that were incomplete and missing parts (i.e. 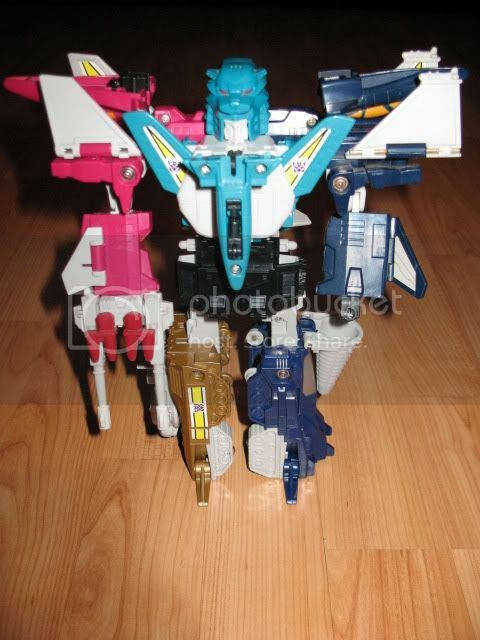 breastforce partners, weapons, & Liokaiser head). The heads could be repros but I have no way of telling from the photo. Not hard to repro these heads as TFW2005's Wheeljaxx can attest to. I think many people have had success in producing high quality Liokaiser repro-heads. He already offered me the whole freaking lot of his liokaisers, al 66 combinerparts of them a month ago. He wanted to quit and offered them for 2400 dollars + shipping. I told him no, because he only had 1 Giftsetbox, a few loose chinese boxes and a lot of incomplete ones. Now he sold the Giftset for 1125(!! ), and the loose boxes (incomplete I might add) for 600+. WHO KNEW????? The current offered prices are ridiculous!!! This is insane. And I want one so bad.